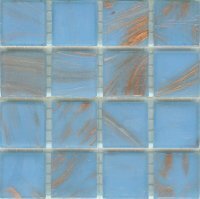 This is a light blue vitreous glass tile with added gold coloured streaks / flecks. The pattern of streaks in each tile is unique so there is always something to catch the eye and to bring the tiles 'to life' when the light catches them! For art work this tile is ideal for bringing interest to areas like seas and skies. Used sparingly one sheet can go a long way and the gold in the tiles will catch the light and bring your work 'to life'. Boxes of this light blue glass mosaic tile with gold coloured streaks / flecks contain 10 sheets of 225 separate tesserae that are held together on a plastic mesh. Each tile is 2cm x 2cm square and 4mm thick. There is a total of 2,250 individual mosaic tesserae per box. Each box covers an area of approximately 1.07 square metres / 11.51 sq ft. Sheets of this light blue glass mosaic tile with gold coloured streaks / flecks contain 225 separate mosaic tiles in a 15 tile by 15 tile grid, with the tiles held together on a plastic mesh. Each tile is 2cm x 2cm square and 4mm thick. Each sheet covers an area of approximately 0.107 square metres / 1.15 sq ft.